The pattern is printed on white paper with colored cutting lines. This is a two pattern combo all in one package and at great savings. The following is a partial description from the package. The complete description is in an image at the top of the listing. #126 Ladies' Round or Trained Gown with a High Stomacher Front circa 1800 - 1810 - Also known as a Bib or Apron Front. This gown opens on both sides of the front, with the entire front bodice and part of the front of the skirt falling down and open. 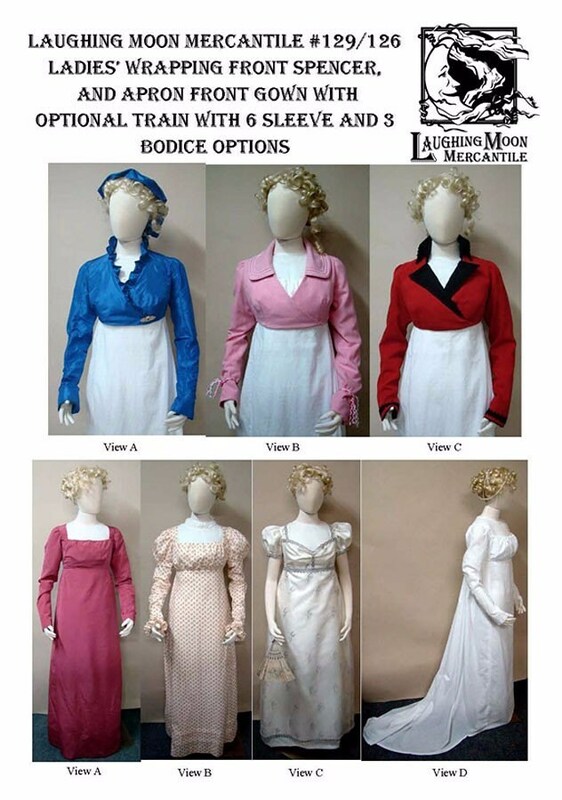 This gown has several sleeve options. 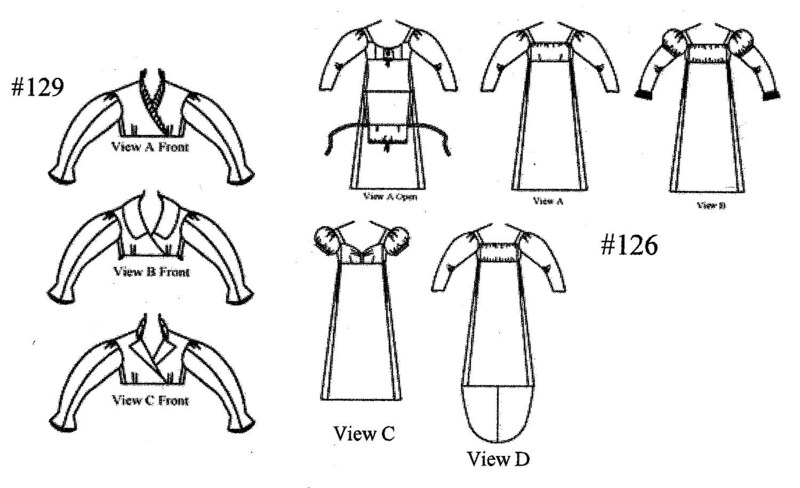 There are three options for the bodice front, which has a drawstring at the top to adjust for fitting. The skirt can be hemmed evenly all around for a round gown, and there are three options for a train: short, medium, and a long train which at the longest adds 22 inches to the back of the skirt. This type of gown was worn for day or evening; the difference being the sleeve length, type of fabric, and the elaborateness of the decoration. #129 Ladies' Regency Wrapping Front Spencer with 4 Collar and 3 Back Variations circa 1798 - 1809 - All Views are Spencer jackets. They all have a wrapping front. View A has a ruffled collar. View B has a long falling collar and a ruffled back. View C has a tall falling collar and pleats at the center back. A fourth collar option is to leave off the collar and just use the collar stand for a standing collar on View C. All Views have a two piece sleeve with attached cuff. 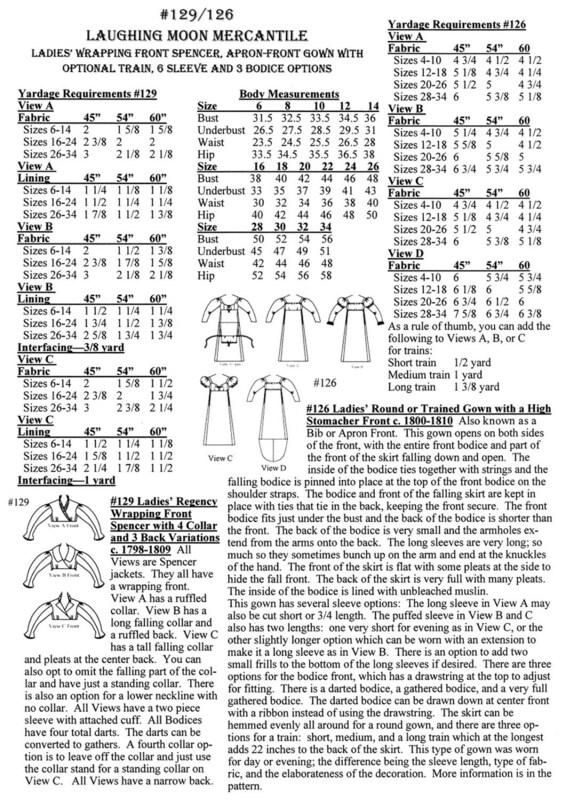 All Bodices have four total darts. The darts can be converted to gathers. A fourth collar option is to leave off the collar and just use the collar stand for a standing collar on View C. All Views have a narrow back.